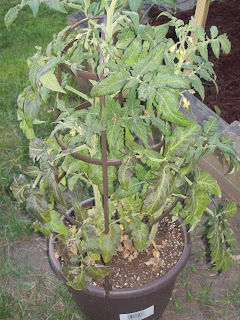 I nearly lost my mind when last month's torrential rain caused everything I'm growing to suddenly start to rot. When the leaves began to turn brown and limp on my tomato plants, I doused it with antifungal spray every day for a week until the plant began to perk up again. Now I have lovely little yellow flowers where my tomatoes are going to come in. 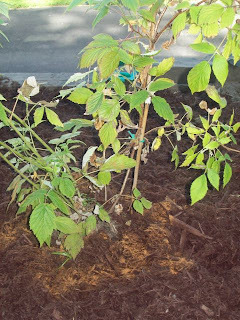 When my newly planted Caroline raspberries started curling up and dying, I scoured the internet for a reason for it, and when nothing proved a satisfactory explanation, I attacked it with antifungal spray, insecticide, and bulb toner. I was leaving nothing to chance. Let nature take its course? Not with my plants! 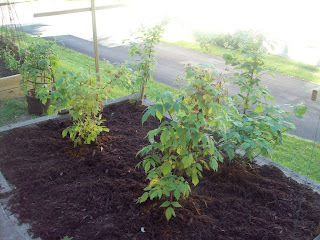 My raspberries, though no longer beautiful, are looking much better. I am not fully happy with shriveled, dried-up looking raspberry stalks, not when they can be greener, lusher, healthier-looking. So today I weeded the raspberry bed and dumped a couple of bags of mulch on top. I've never grown raspberries before, but as soon as I saw the pathetic-ness that was that long-neglected raspberry bed, I made it my mission to turn the proverbial sow's ear into a silk purse. Imagine my delight to discover that there are little pre-raspberry blooms forming, even on the damaged stalks. I am so excited! But am I satisfied with that? That I have raspberries coming in? Absolutely not. There are the ants in my raspberry bed. Although beneficial to the garden, I do not want them sniffing around my raspberries. I have plans for those raspberries. 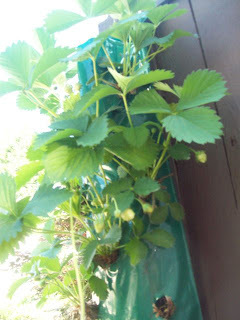 Sometime in the very near future, I will be making jam--from my very own garden. 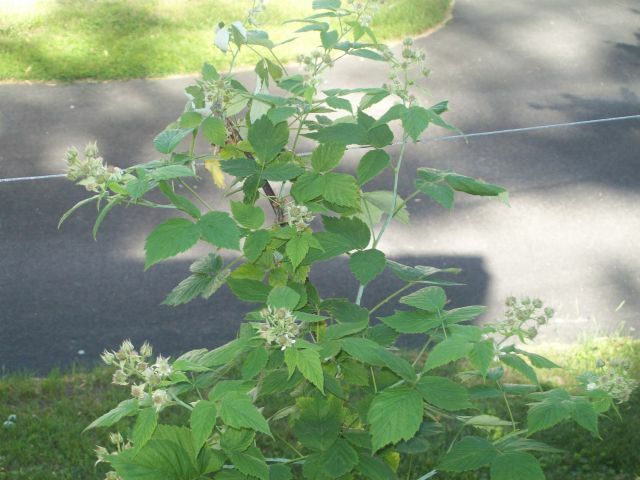 The ants could ruin everything if they get to the ripe raspberries before I do. I tried an organic insecticide soap, but my ants merely laughed at it and carried right on laying scent trails up my raspberry canes. So today, after laying the mulch down, I sprinkled cinnamon (a natural ant repellent) all around my plants. I'm hoping this does the trick, but as a side benefit, my raspberry patch smells wonderful. Ants may not like the smell of cinnamon, but I definitely do! 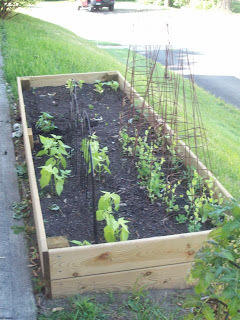 So far my beans and peas are looking good, but something has been eating my squash leaves. The lettuce I planted doesn't seem to be producing, so I re-planted more lettuce seeds today, and also planted a Thai basil plant. I love Caprese salad, and basil is so necessary to its flavor. I also love Holy Basil chicken whenever we eat Thai. With some Thai basil around, I might get inspired to try the recipe myself. I was also pleasantly surprised to discover that, seemingly overnight, my strawberry plant grew an abundance of little green strawberries. I can't wait for them to ripen. The boys love to go work in the garden with me. They came out with their little sand shovel and rake to help me spread mulch around today, and I frequently have help when it's time to do some watering. They are so proud of all the food that's growing, and I am proud that we're finally gardening as a family. It's something I've dreamed about doing even before we ever had kids, but somehow, before now, we were never quite able to pull it off. This year, I think it's going to finally work out for us. You have a beautiful garden indeed and you put me to shame. I don't know... there never seems to be time. But when I get into it I love gardening. You've inspired me to get going. I am going to try the trick with the cinnamon! See if I can shoo away these ant-like bugs.